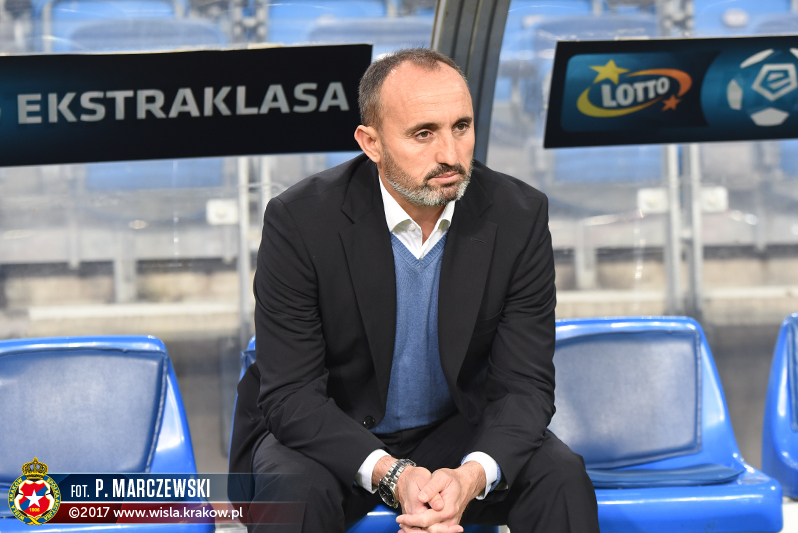 A week after losing the ‘Classic’, Wisła had another tough game against the Ekstraklasa Leader Lech Poznań: unbeaten at home, best league defense, and second best home attendance, Wisła had to get ready for a boiling game. Lech is one of the best playing teams, but Wisła could hope to surprise them, given Poznań’s recent slight drop in form. Better not be late, because Wisła got the game off to a flying start, with an early goal scored after 8 minutes only. Just like they got us used to this season, their high intense pressure early in the game, paid off. In literally the first action of the game, 19-year-old Wojtkowski (unexpected in the starting lineup) did a great job protecting the ball to serve Carlos ‘Carlitos’ Lopez, whose shot hit the nets. Wisła’s serial scorer added a 10th goal to his personal record this season. After the cold shower, Lech Poznań’s reaction was stupendous. That was to be expected. The home side took the control of the first half and created five close goal chances, all saved by Buchalik. Wisła’s goalkeeper was kept very busy, and showed some world-class saves to keep his sheet clean. Lech was still behind the steering wheel after the break, keeping most of the possession and creating more goal chances. At several occasions, the ‘Kolejorz’ (the Railway Men, the Lech nickname) received too much space from Wisła defenders, but did not take advantage of them, as they bumped again against Michal Buchalik, or lacked precision at times. They wasted so much, even former Cracovia wonder boy Deniss Rakels, did not manage to find the nets against his old city rivals. One disallowed goal later (offside position), Lech finally equalized in the stoppage time. A ball the Wisła defense struggled to clear ended at Jevtić’s feet, whose shoot offered an unhoped draw to his colors. Last time Wisła won in Poznań was in 2014. A win would have brought them to the league table top. But let’s be realistic, Lech deserved a draw, even a win to be fair. They controlled the game and created so many goal chances. Luck is part of football, but Wisła did not really manage to threaten their opponents enough. This sheds light on ability to secure a lead, especially against a serious title candidate. A draw against Lech is of course very good – many teams would sign for such a result. But it tastes sour when the equalizer is conceded 30 seconds from the end. The Pasy welcomed Nieciecza, also sitting in the league bottom and fighting to leave the red zone. With only one point difference between both sides, it was a crucial game for Cracovia, since a win would give them some distance with the league bottom. They were favorites given their recent form and the fact they played home. So, full confidence on their side. Coach Probierz kept the same tactics as the previous week and welcomed the experienced Sandomierski and team captain Covilo back in the starting lineup. Cracovia started the game with the best intentions. And even if the visitors created the very first alert, the home side quickly took the control back and responded via Hernandez then Wójcicki, both attempts were off target. However, not much happened in the first half. The pace was low, the game slow and the level kind of reflected both teams status in the league. Strategically also, both coaches started with a rather defensive minded setup, which did not offer much to get excited about. Things improved after the break. Once again, the visitors got the first goal chance before Cracovia reacted with the best action at that stage. However, the unlucky Helik saw his attempt hit the post. And while captain Covillo also got a chance 20 minutes later, with a header off target, fans’ patience was finally rewarded in the last 10 minutes. Michal Helik once again had the flair to leave his defense and follow Drewniak’s cross before finishing the action with an incredible back heeled flick. A move worthy of world-class striker skills, to give his team a deserved lead. However, the worst was to come. Just like the week before, the visitors managed to equalize in the stoppage time. A poor defending on the side allowed Nieciecza to combine smoothly. A first attempt hit the post, but Jovanović scored on the rebound to make 1-1. Final score and hammer blow. For the third time this season, Cracovia conceded a late equalizer. Quite frustrating, given their need for points. They just gave away four points in their last two games. One minute makes the difference in football, and it requires keeping a full concentration until the end. And more than any individual mistakes, Cracovia’s overall play style is poor. The Pasy seem to struggle with imposing their pace, controlling and running the game, and creating chances, especially at home. Offensively, Krzysztof Piątek did not emerge yet. With six goals so far, he only scored one in his last five games. 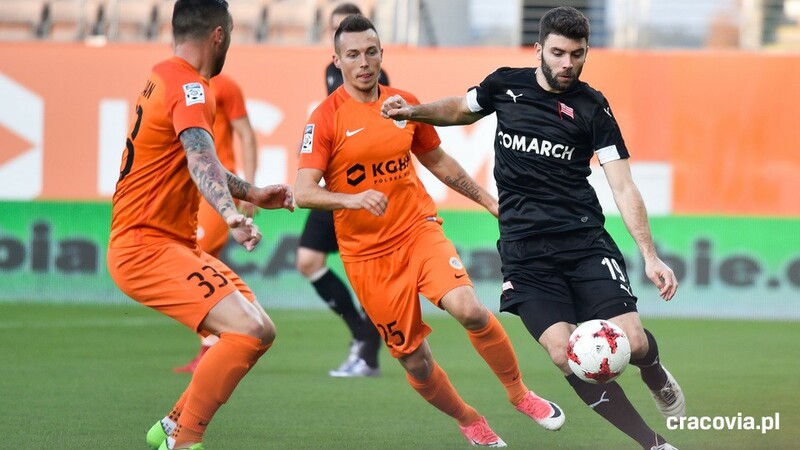 A week after his goal against Sandecja, Cracovia had to rely on their 22-year-old central defender Michal Helik to score and earn points, which highlights these offensive struggles a bit more. On the bright side, this made Cracovia unbeaten for four consecutive games, which is a good step forward. That means consistency and ability to stabilize their results. Hopefully, the efficiency will follow soon. Wisła welcomed Sandecja Nowy Sącz for their first ever meeting in Ekstraklasa. Sitting at the 7th league spot, Wisła needed a win to get back in the race with the other teams at the top. Coach Ramirez decided to change a few elements, welcoming Ondrášek, Halilović, and Perez back in the starting lineup after a long time and moving Arsenić from the side as a central defender. 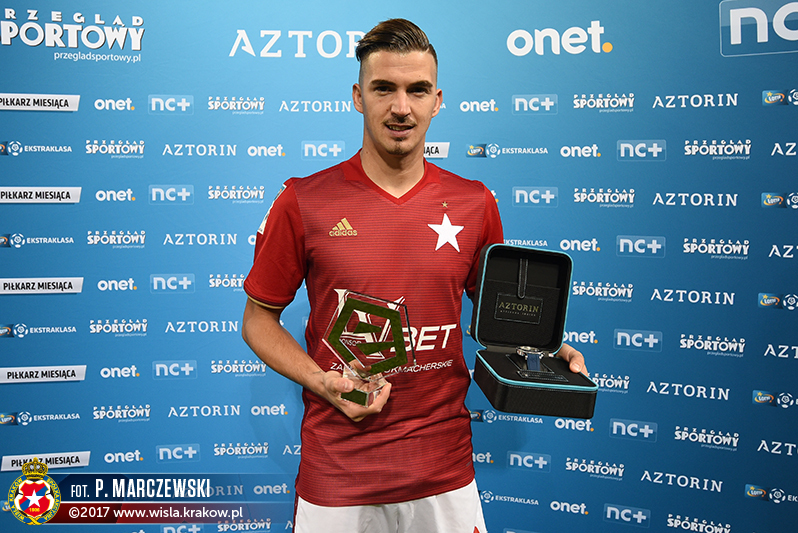 Before kickoff, Carlitos López received the “Ekstraklasa Player of the Month” Award. Wisła’s top scorer was rewarded for his strong performances and goals last month. Wisła got us used to speedy starts. This time again, no time wasted with a goal scored after 11 minutes. A smooth offensive action allowed Carlitos, from the left side, to ideally serve Jesus Imaz. The winger scored his second of the season, finishing a 100% made-in-Spain action. 20 minutes later, Wisła responded instantly to a long distance shot from the visitors. Once again, Carlitos on the side served perfectly Imaz, whose curled ball was brilliantly saved by Sandecja goalkeeper Gliwa. After an animated first half, Wisła kept control had and their opponents under intense pressure. This is how they regained possession at the 50th and triggered a quick counter-attack. Carlitos dribbled two defenders before passing to Boguski, whose goal was unfairly disallowed for offside. Wisła obtained a valid penalty shortly later. And who else than Carlitos to take it. The “Matador” scored without trouble, giving his team a comfortable lead and adding an 11th goal to his season record. With a goal and an assist, Carlitos celebrated his Award the best possible way. In fact, he even scored another one in the added time, before the referee unfairly disallowed it for offside. The second incorrectly disallowed goal for Wisła. However, the home side obtained another penalty a few minutes later. This time scored by Perez, to seal the final score to 3-0. 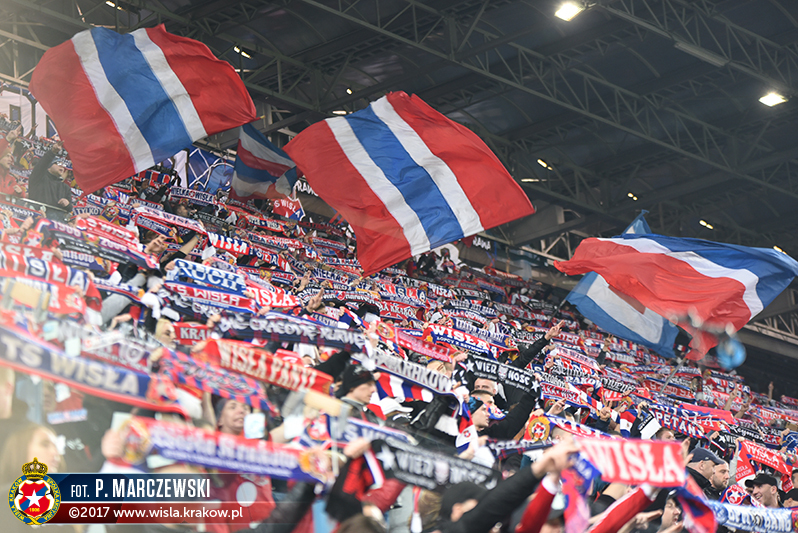 It was a strong and convincing performance from Wisła. They got the job done and showed how impressive their offensive power is. The visitors were simply not able to compete. One name stood out: Carlitos. The Spaniard was unleashed – he scored, made his teammates score, and justified his status. But more than one player, the entire team gave satisfaction to the coach and the fans before welcoming Pogoń Szczecin in two weeks. A tough away game awaited Cracovia traveling to Zagłębie Lubin, a team strongly sitting mid-table and complicated to face, especially at home where they remain unbeaten this season. The Pasy traveled with confidence, given their unbeaten last four games. However, they are back in the relegation zone, three points ahead of Pogoń Szczecin. With only one player change (Deja replacing Mihalík in the center), coach Probierz chose not to shake his starting 11, to keep the automations. And while the game started slowly but surely, Malarczyk had the first goal chance of the game. His header was well deflected by Polaček, the home goalkeeper. The home side responded a few minutes later with the score opener at the 24th. Lubin combined quickly on the side to reach the danger zone, where Tuszyński was lucky to see the ball bounce on his knee, before passing the line. However, Cracovia found the strength to react and equalize 10 minutes later. Starting from the defense, the ball traveled through no less than eight Cracovia players before the goal. The Pasy took the time to build and patiently look for the gap, before speeding up and scoring. Javi Hernández ideally served by Covillo, did not lose his face-to-face with Polaček, to score his third of the season. Only a few minutes after the break, Cracovia took everyone by surprise. Starting again from the defense, the Pasy recovered a ball they instantly turned into a deadly quick counter-attack. Krzysztof Piątek and Matic Fink combined by the opposite box, where the Slovenian defender fired a world-class curling shot into the nets. Unstoppable for Polaček, and the Pasy on the lead. Cracovia spent the rest of the game defending. The home side had several goal chances, all blocked by Sandomierski who showed once again his talent. This win definitely has a special flavor for Cracovia. The game was complicated and the opponent tough, so the victory tastes better. However, a few aspects still need to be improved. The Pasy should be able to control the possession better and create more goal chances. Against his former club, Cracovia striker Krzysztof Piątek did not manage to find the nets, and it might become frustrating for him and the team. However, he did work hard and actively contributed to the second goal. This win will surely be seen as a reference for Cracovia. Not only for the points it represents, but also given the opponent and the way they played. There is definitely an improvement week on week, and the team seem to be working hard to reach a higher level. After their dark series of eight consecutive games without a single win, the Pasy are now unbeaten for five games in a row. They seem back on the right track and will need to confirm the trend. Next on their plate: another away game against Piast Gliwice, in a week and a half.